John Edward Bresnahan was born on January 30, 1911, in Lawrence, Massachusetts, the son of Dennis F. Bresnahan and Helen V. Spellman. He had one sister. John was baptized on February 27, 1911, at Saint Mary's Church, Lawrence, Massachusetts. He attended the Bruce Public School, Saint Mary's Parish Grade School, and Lawrence High School. He entered Augustinian Academy, Staten Island, New York, as a postulant in September, 1927, and completed his high school education there. He was received into the novitiate on September 9, 1928, and after his year at Good Counsel Novitiate, New Hamburg, New York, he professed simple vows on September 10, 1929. He then attended Villanova College, where he received his BA in Philosophy in 1933, having professed solemn vows on September 10, 1932. He pursued theological studies at Augustinian College, Washington, D.C., from 1933 to 1937, and was ordained to the priesthood on June 9, 1936, at the National Shrine of the Immaculate Conception, by Bishop John McNamara. He received an MA in Classics from the Catholic University of America in 1937. “Fr. 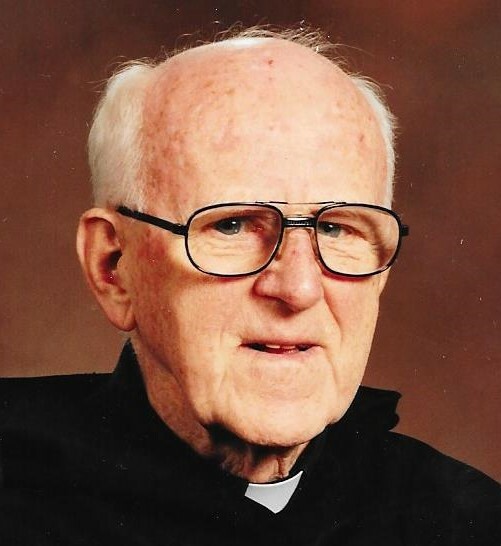 B”, as he was known by all, was assigned to Saint Thomas Monastery from 1937 to 1943, and Saint Mary's Hall from 1943 to 1957, and taught Latin and Greek at Villanova University. During this period he obtained a PhD in Classics in 1949, from the University of Pennsylvania. From 1957 to 1959, he taught at Merrimack College, North Andover, Massachusetts, and returned to Villanova University for one year for the 1959-1960 academic year, before being assigned in 1960 to teach theology at Augustinian College, Washington, D.C. This he did until 1968, when, with the founding of the Washington Theological Coalition that same year, he became the librarian at Augustinian College, a position he held until 1995. From 1977, he was a member of the Austin Friars community, first in the "little house" on the Augustinian College property. As librarian, Fr. B advised many theological students of our own, and many other communities, as they researched topics for their class projects and papers. Throughout his career he wrote and edited a number of Augustinian publications. An avid and prolific reader, he had a wealth of knowledge and insight that he most willingly shared with all. In 1995, at the age of 84, he was assigned to Saint Thomas Monastery, Villanova. His generosity and gentle kindness was a blessing to the monastery community. He died peacefully at St. Thomas Monastery at the age of 102. At the time of his death, he was the oldest Augustinian in North America. He epitomized the example of a true follower of St. Augustine in the sharing of what he learned with others and his life in community. A wake was held on Thursday evening, December 12, 2013 at St. Thomas of Villanova Church. Immediately following, the funeral Mass was celebrated by the Prior Provincial, Father Anthony Genovese, O.S.A. Father Lee J. Makowski, O.S.A., preached the homily. Father Bresnahan was buried in the Augustinian plot at Calvary Cemetery, Conshohocken, Pa. Newer Post Thomas A. Burke, O.S.A. Older PostJohn T. Emmett, O.S.A.